POP UPS / OETL Co.
Join us for this exclusive access to the collection and enjoy other in house events! This will be a 3-day festival within Modern Nomad Store. Bring your family and friends to experience flavors go global cultures! #Unbranded is back and #OETLCO will be featured in session two! Join us Thursday - Saturday 11-7pm for some of Dallas’ best holiday shopping. at Modern Nomad in Denver Colorado. IT'S BEEN A GREAT STAY! AND IT IS TIME TO CHECK OUT. Join us for bubbles and wino while we say goodbye and thank our host The Statler Hotel, and our sponsors Unbranded and Downtown Dallas Inc. for a wonderful experience! Last Chance to shop our local designers and handmade goods! And enjoying our new home at The Statler Hotel, thanks to Unbranded and Downtown Dallas Inc. Come and visit us as well as our dear friends' brands. Window installation by über artist Ruben Burgess @sartorialnolift. Come help us say “goodbye” to our current space and perhaps “hello” to our next experiment. Here today but not gone tomorrow! 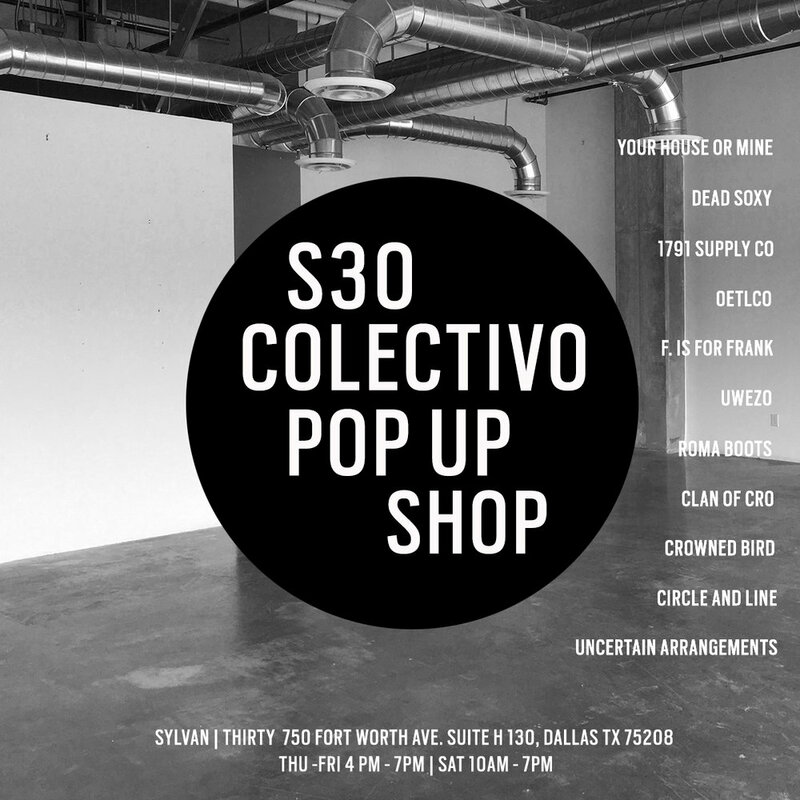 Share, Like, and Follow us @oetlco, @s30colectivo all the way to @sylvanthirty. Visit our Always changing Pop Up Shop. Hosted by Birch Modern Mercantile. For some Italian wine and Argentine empanaditas. The year of May, Noshii, Your House or Mine, and Oetlco. Complimentary Nail Art by Ms Patty Cake. Small bites, and EnCanto Pop Cocktails. SET AND READY . . . Looking forward to this weekend with a fabulous group of vendors at #setholidaymarket in the old historic Church! join us anytime from 10am to 8pm. #ciao! #Unbranded is back for its third year and #OETLCO is featured in session one. Join us on Thursday night for a kick-off Happy Hour or stop by Friday/Saturday. We are so pleased to announce our month long #popup event with @jux.santafe! This gallery is an incredibly creative and inspiring space filled with endless surprises around every corner and we cannot wait to be a part of it all. New arrivals from @oetlco ! Located in the #railyarddistrict in Santa Fe, NM. CHECK OUT OF FRESH NEW ARRIVALS! QUENCH YOUR THRIST . . . While finding new treasures from OETL Co. Imbibe & relax with friends in this casual-uber chick space. La La Land Pop Ups! We're headed west! Bringing our own Bastado. Escape the heat and join us for some cool air and discover fresh finds from our designers. Enjoy happy hour cocktails and delicious edibles from Bar Max and shop our new arrivals. Enter to win a special OETL Surprise with your vino or drink purchase. See you there! STOP BY OUR POP UP AT SET & CO.
Find something for your Valentine, check out the new items in our Collection, and have a drink with me and the lovely folks at Set & Co. If you missed us at last weekend’s Tyler + Davis Holiday Market, here’s one more chance to get what you really, really want before the holiday. Day two of our inaugural Pop Up Shop with a few of our friends and sponsored by the lovely folks over at Set & Co.
Come visit us in person at our inaugural Pop Up Shop with a few of our friends and sponsored by the lovely folks over at Set & Co.